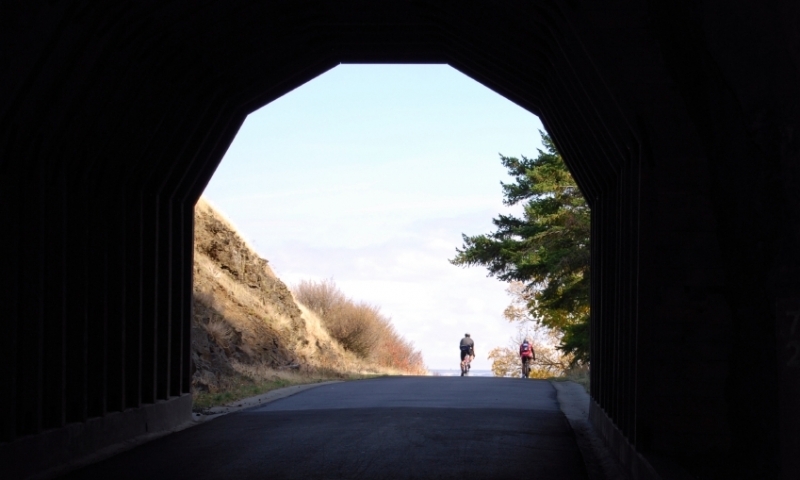 Situated on the Historic Columbia River Highway State Trail between Hood River and Mosier, Oregon, the Mosier Twin Tunnels are an engineering marvel providing panoramic views of the Columbia River Gorge’s east end. Located between Hood River and Mosier, Oregon on the Historic Columbia River Highway Trail. Trailheads located at both the eastern and western end of the trail segment. Find more information at the Twin Tunnels Visitor Station located at the western trailhead. Exploration of Oregon’s scenic Columbia River Gorge should include a visit east of Hood River on the Historic Columbia River Highway. Parallel to the highway near Mosier check out the 4.6-mile Columbia River Highway State Trail, a partially-paved section open only to hikers and bicyclists. An easy hike (less than a mile from Mosier) will take you to the Mosier Twin Tunnels, a spectacle worth seeing. The Twin Tunnels were completed in 1921, but closed in 1955 when traffic was diverted to the newly-constructed Interstate-84, and the tunnels fell into disrepair. Recently restored and reopened in 2000, Mosier Twin Tunnels have two windows cut through the rock to allow magnificent views of the Columbia Gorge, along with the stunning geologic formations cut by the river’s progress. Reach the Twin Tunnels via either Mark O. Hatfield West Trailhead near Hood River or the Mark O. Hatfield East Trailhead just outside of Mosier. The tunnels are located closer to the eastern (Mosier) end. From the west, take I-84 to Exit 64 and follow the signs for the Mark O. Hatfield Trail. From the east, use the parking lot under Bridge of the Gods in Cascade Locks. Both trailheads require a day use pass obtainable at the yellow self-service machine at each trailhead. Hike or bicycle this gentle 4.6-mile section of partly-paved State Trail. Enjoy the views from the tunnels plus the fir forest and native Oregon plant and wildlife along the way. Multiple viewpoints overlook the river along the 3.5 mile segment from the tunnels to the west Mark O. Hatfield Trailhead. Visit the Twin Tunnels Visitor Station which has restrooms, information, and a gift shop.